Ten years from today, who will be playing your dream rock festival bill? David Bowie and Prince headlining? A young Kurt Cobain in full-throated roar? Led Zeppelin at their world-shaking peak? Queen led by Freddie Mercury in his imperial pomp? How about Janis Joplin duetting with Jim Morrison? Lemmy reunited with his old pal Jimi Hendrix? Or Elvis Presley fronting an all-star supergroup featuring John Lennon, Lou Reed and Sid Vicious? This Night of the Living Dead fantasy is not some macabre future episode of Black Mirror. Thanks to advances in hologram technology, all of the posthumous comebacks listed above are not just possible but increasingly likely. Digital 3D doppelgangers have been creeping into concert halls for more than a decade now. Holographic simulations of Madonna and Gorillaz performed together at the Grammy awards in 2006. A hologram of rapper Tupac Shakur grabbed global headlines with his Coachella Festival appearance in 2012. A computer regenerated Michael Jackson moonwalked onstage at the 2014 Grammys. Many more are in gestation, from Abba to Zappa, Roy Orbison to Lemmy. But way out in front of this technological revolution is the late Ronnie James Dio. A holographic replicant of the legendary frontman, who died in 2010, made a sensational live debut in front of 70,000 surprised fans at Wacken Open Air festival in 2016. A European tour followed late last year under the name Dio Returns, featuring Dio’s long-serving band alongside guest singers Oni Logan and Tim “Ripper” Owens, breaking new ground as the first ever live hologram rock show to go on the road. A more extensive world tour is planned for later this year. 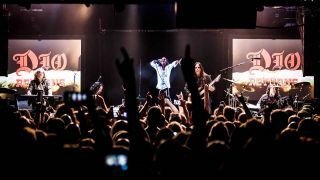 The Dio Returns show in London, at the mid-sized Islington Academy, was a packed and warmly received affair. The set-list spanned Dio’s Black Sabbath, Rainbow and solo years with classic anthems like Heaven and Hell, Catch the Rainbow and Straight Through the Heart. Synchronised to vocals lifted from vintage live recordings, the Dio hologram was a distracting gimmick at first, a white-smocked phantom that seemed to hover behind the band, his gestures limited and repetitive, his not-quite-human features invoking the eerie effect that computer animation designers call the “uncanny valley”. But after a few numbers the alienating oddness faded and Digital Dio began to feel like just another visual effect in the modern rock-show toolbox. Though clearly still a work in progress, the latent potential is undeniable. Dio’s band members concede that any new technological change, from CDs to mobile phones to digital downloads, always meets initial resistance. “There are always people who will rage against change, it’s very disturbing to a lot of people,” nods keyboard player Scott Warren. “This is a dramatic new revolution in technology. We are at the forefront of that, and fortunate to be placed there because of Ronnie’s legacy. Who better suited to be at that frontier than Ronnie James Dio? I think the doubters will adjust to the idea over time. It’s like future shock. The Dio Returns show has also served a test case for other musical trustees who may want to resurrect a famous family member to perform their back catalogue live again. Eyellusion are already working on a stage show fronted by a Frank Zappa hologram, despite the added complication of navigating deep rifts between Zappa’s children Ahmet, Diva and Dweezil. One of the pre-announced guest players, guitarist Adrian Belew, has already dropped out of the summer tour dates, branding the project “caustic and divisive”. Where Dio are breaking new ground, others will soon follow. Live holograms of pop diva Whitney Houston and rapper Notorious BIG are reportedly in development. In April, meanwhile, veteran Manchester-based concert promoter Danny Betesh will bring a holographic version of Roy Orbison to the UK for an extensive arena tour backed by a full orchestra. Betesh, fresh from seeing the first pre-tour showcase in New York, believes this technology will prove a boon to old-time artists and their fans. Betesh suggests that holographic shows will fully never replace live human performers, but could still grab major market share as an alternative option. And of course, as this technology evolves, there is no reason why it should remain limited to resurrecting dead artists alone. Where demand remains high but veteran performers can no longer face the stress of touring, holograms could fill a gap in the market as the ultimate tribute act. Indeed, TV talent-show tycoon Simon Cowell is currently developing 3D “digital avatars” of the very-much-alive Swedish pop titans ABBA for a world tour next year, backed by a full live band. Jeff Pezzuti believes “a million per cent” that fully-rounded 3D hologram performers will soon replace the current Pepper’s Ghost simulations. This is one reason why Eyellusion created their digital Dio footage in a super hi-resolution 5K format that can more easily be adapted for AR (augmented reality) and VR (virtual reality) in the future. Pezzuti also sees plenty of potential for holographic shows by living artists, including “de-aged” versions of legendary bands like the Rolling Stones, Iron Maiden or Fleetwood Mac performing their early classic albums. In a quick straw poll of the Dio band for fantasy future hologram candidates, David Bowie, Freddie Mercury, Jimi Hendrix, Jim Morrison and Jon Lord inevitably lead the pack. Once this technology takes off, of course, all of these and more will be possible. Imagine the ultimate classic rock supergroup jamming together, forever. From classical maestros to classic rock legends, don’t fear the digital reaper. Death is no longer an obstacle to a healthy touring career. For those about to virtually rock, we salute you.